In Australia we have some amazing manufacturing companies that are greatly undervalued. We have teamed up with a wax manufacturer who has developed an amazing soy wax blend that will do about everything you ask of it. OzSoy Ultimate was initially developed as a container wax in an attempt to have great fragrance throw as well as glass adhesion - no more wet spots, but it does this and so much more. Further experimentation has led to the discovery that it can also be used to make fabulous pillar candles, and melts as well! This is the wax the big Australian manufacturers are moving to, and we are in on the ground floor. We currently hold exclusive distribution rights for this wax within the crafting sector and are happy to talk to others who would like to stock this also. It is too good for us not to share. 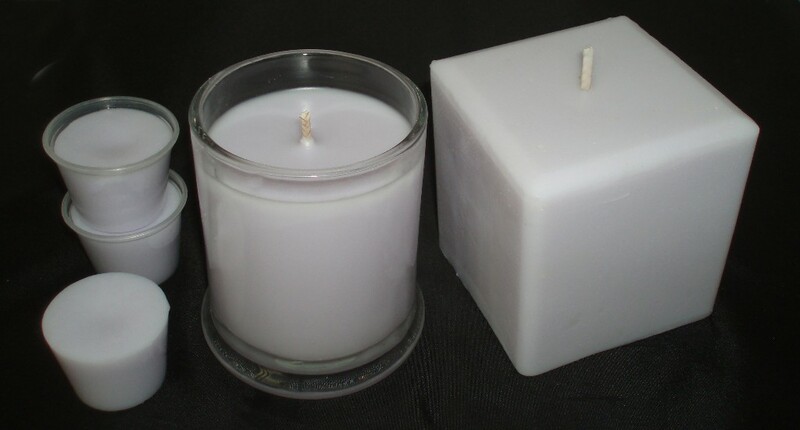 Holding a whopping 7-10% fragrance load, products made with this wax have a great scent throw making them popular with all scented candle lovers. A container candle with no adhesion issues, a one pour pillar candle (no top-ups) and soy shots were all made from one pot of the same wax. The only additives were colour and fragrance (lavender fragrance oil in this case). An amazingly simple product to use. Our new OzSoy Ultimate comes in an easy to cut block allowing you to visually work out how much you need for your project. No more flicking flakes, knocking over bags or digging rocks out of boxes. So much simpler.